About Yogini Ashram is an overview of the Ashram and teachers where the ancient, dynamic traditions of Kriya, Tantra, and Yoga are taught, cultivated, and practiced. 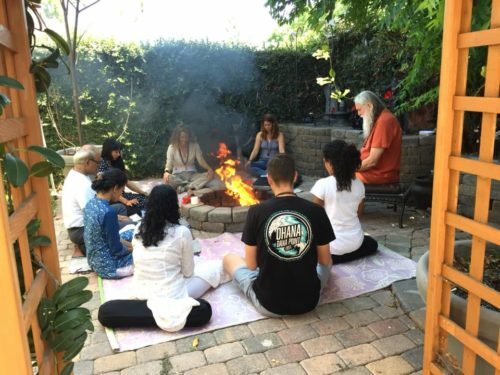 The practical techniques for awakening kundalini (Kriyas) trigger changes in the consciousness, and turn the mind toward the inner Self, or Soul. The individual Soul (Jiva) incrementally merges with the Divine Cosmic Soul (Shiva). Kriya Tantra Yoga is about a grand spiritual tradition, indigenous to the Indian subcontinent, and expounded by the great Sages of Yoga and Tantra (Siddhars). The climax of the tradition is a Yogi of perpetual youth, Babaji, Babaji is directly accessible as a protector and guide to all who seek him. Kriya Tantra Yoga is an integrated path of balance between all aspects of the Divine. Babaji’s tradition incorporates the main body of Shaiva, Vaishnava, and Shakti principles. Classical techniques awaken kundalini, and break through the blockages that inhibit spiritual awakening (grantha knots). The techniques control the nine gates, and include a wide variety of meditation practices, which are taught at various levels. Knowledge of Puja, Nysha, and Mudras are taught, and courses in the cosmology of Kriya Tantra Yoga are offered. Yogini Ashram was conceived in 1988, through the guidance of Babaji. The Ashram and its teachers provide an oasis of spiritual light and energy. Yogini Ashram also houses the largest collection of traditionally hand engraved copper yantras in the western world. Beginning, intermediate, and advanced private and public trainings are offered. Regular Pujas and other events are held. All sincere souls are welcome.